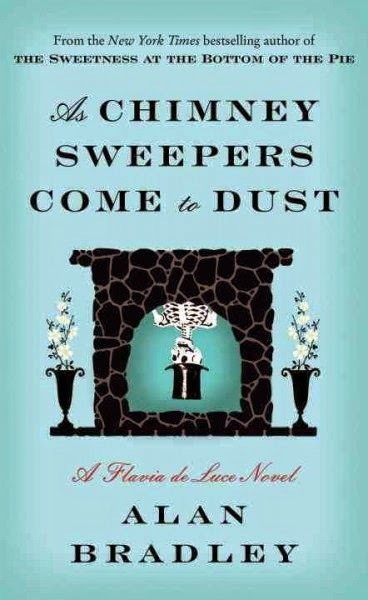 As Chimney Sweepers Come to Dust is the latest installment in the Flavia de Luce mystery series by Alan Bradley. And is the first book in the series that takes place in a location other than the large English estate of the de Luce family. Set in a girls boarding school in Canada, 12 year old Flavia de Luce once again finds herself in the middle of a mystery after discovering human skeletal remains in one of the chimneys of her new home. The story follows her attempts to once again solve a murder, while also unraveling more of the mystery that surrounds her deceased mother's enigmatic past, and the secret government agency of which she was a part. I was turned on to the Flavia de Luce series by a friend who knows that I enjoy all things science, as well as strong well written female characters. It has quickly become one of my favourite mystery series. This newest one is almost a complete reinventing of the series, come at just the perfect time when I was beginning to wonder if the entire rest of the series would always be set up in the same way. As Chimney Sweepers Come to Dust introduces the reader not just to a new location for our intrepid heroine, but also to an entirely new cast of characters to interact with her. In fact, the only familiar character is Flavia herself, while everyone else is a stranger. The Flavia de Luce series is wonderful because it takes the notion that all mysteries written for adults must have adult protagonists, and breaks it apart. You see a girl who seems to be equal parts Harriet-the-Spy and Violet Baudelaire dealing with issues and situations in an adult world while maintaining her fiercely independent and fiery personality. The series is captivating, and wonderfully written, and it is quite easy to find yourself three books into the series without realising it. I definitely read this new one too quickly and now have to go back and reread the series from the very beginning (The Sweetness at the Bottom of the Pie) until he publishes the next one. As Chimney Sweepers Come to Dust, the latest adventure of Flavia de Luce, is available at the Ocean City Free Public Library.